Simpler, easier team collaboration? Discover SideKick. Radio’s only fully integrated real-time show planner. It takes excellent organisation to put out a smoothly flowing radio show that seamlessly integrates every type of content, especially when that content is being created and updated while you’re on air. Breaking news, weather & traffic updates, social media activity and audience interaction can all lead to on-the-fly playlist and script changes. Impeccable teamwork between DJ, producer and other team members is everything. Which means having the right tools to ease your collaboration is essential. Comprehensive collaboration, the easy way. 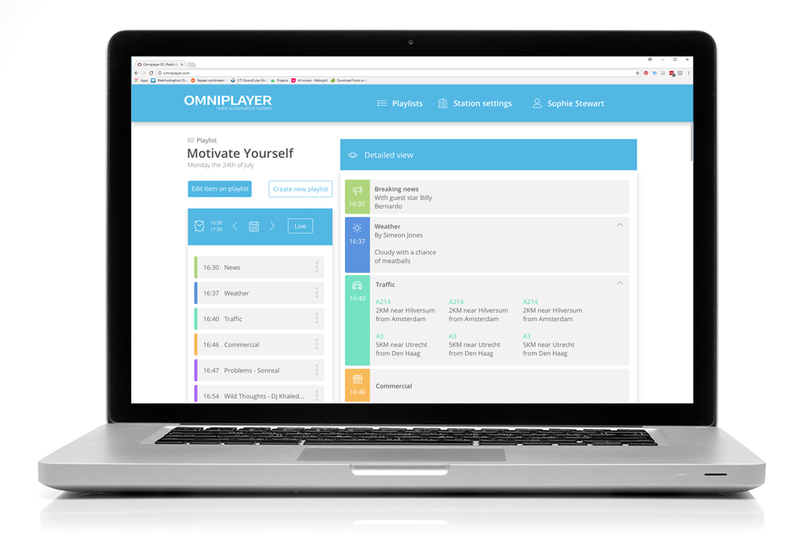 SideKick is OmniPlayer’s comprehensive workflow planner for everything from station programme scheduling to show-by-show content management. It’s where station managers organise programme scheduling. Where DJs prepare and navigate each show’s running order, obtain talk-time content and keep tabs on the playlist. And where producers review live-feed content input and provide DJs with related scripts. During broadcast, SideKick is where DJ, producer and content come together on one easy-to-follow screen, so every DJ can confidently put out a smoothly flowing show that’s relevant to breaking news, playlist changes and audience interaction. SideKick works online, so can be viewed from any web-connected station. This means producers and scriptwriters can, if necessary, work from another space without need for a full OmniPlayer console. Because live shows need to respond to live events. SideKick automatically updates show plans with your selected live feeds for news, weather & traffic, audience communications, social media and anything else you choose. So you’ve always got relevant facts immediately to hand about everything from breaking news to background on guests, people in the news or artists whose songs your show is playing. SideKick enables producers to edit both scripts and playlists on the fly, with the DJ remaining fully informed in real-time. Script updates to complement live information feeds mean DJs can deliver completely up-to-date commentary at the planned moment and make the very best use of every talk-time segment. And because SideKick is fully integrated with OmniPlayer’s playlists, producers can add to and alter playlists in response to news, live discussions and audience interactions, with DJ’s retaining a real-time view of the updated playlist. SideKick is the only workflow planner to display real-time playlist changes before actual play. And with that, the only workflow planner which gives the DJ a comprehensive live view of all up-coming content in one screen.